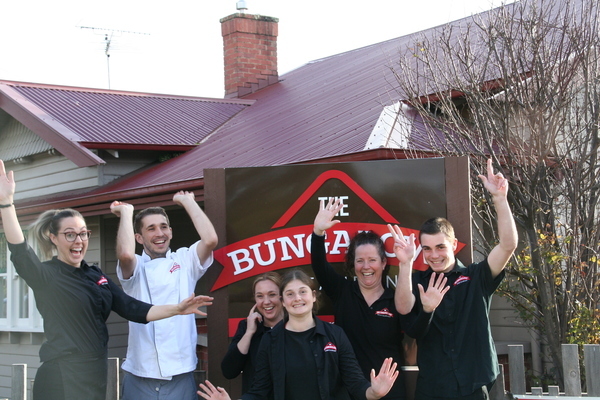 The team at The Bungalow are excited about their early success. Drysdale’s The Bungalow Restaurant was a finalist in the Tourism and Hospitality category of the 2018 Geelong Business Excellence Awards. The restaurant’s name was an easy choice for owners Kerry and Simon Bell as they converted a 1932 Californian bungalow to accommodate their new venue. The pair discovered an interesting history to the former home as they prepared its revitalisation. “When we found out that the original residents made food for the community, and were foodies like us, it made perfect sense to name it The Bungalow’.” Kerry writes in her business awards entry. The original residents, Alfred and Elsie Butcher, built the bungalow for £458, 12 shillings in 1932, according to Kerry and Simon’s research. “In 1941 Elsie began providing meals for soldiers who were stationed at the Drysdale reserve, prior to their posting overseas during World War II,” the pair explain. The heart-warming kindness and community spirit has inspired Kerry and Simon’s passion for the food they prepare and serve at The Bungalow. “Through our customer service, employee talent and consistent and predictable growth we will be the best restaurant in Drysdale,” they says.